A cataract is a dense opacity of the lens. Horses may be born with cataracts (congenital cataracts) or cataracts may develop after birth in the foal (juvenile cataracts) or the adult horse (adult or senile cataracts). There are multiple causes of equine cataracts. While cataracts may be inherited, this is not overly common in the horse. Cataracts may also be caused by an injury to the eye, but most cataracts in adult horses are caused by diseases that lead to inflammation within the eye. One such disease is equine recurrent uveitis, also called moon blindness or periodic ophthalmia. The management of equine cataracts depends on the type of cataract present. Some cataracts remain small enough that vision is not impaired; these cataracts may require little or no treatment, except periodic rechecks by the veterinary ophthalmologist to monitor for changes and the possible need for medications. Congenital cataracts in foals may require surgical removal of the entire lens if the cataracts cause blindness. The lens in an animal less than one year old may be removed under general anesthesia by breaking up the lens with a needle and aspirating it from the eye. 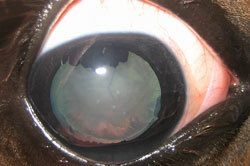 Cataractous lens removal in a horse less than one year old has a 60-80 percent chance of success for vision. The procedure is benefited if the foal is halter broken and easy to handle. It must also be kept in mind that congenital cataracts may be inherited, and the trait passed to progeny. Cataracts of an adult horse may only be removed surgically if the eye does not have other inflammatory diseases and if the deeper structures of the eye are functional. The lens of an adult horse is harder than the foal lens; therefore, surgical removal of an adult lens is more complicated than removal of a foal lens. Lens removal in the adult horse has approximately a 50 percent chance of success for vision. Surgical removal of the lens is followed by intensive treatment with medications; it may be necessary to continue treatment for several weeks to months. During the treatment period, the horse should be kept in a darkened stall with limited exercise. Hay should be removed from overhead racks and fed on the ground. Complications of lens removal in any horse include: persistent or recurring inflammation inside the eye, corneal ulcers, corneal cloudiness, glaucoma, bleeding, or retinal detachment. Any of these complications may lead to discomfort, blindness, or shrinkage of the eye. Any horse that has had surgical lens removal is not considered “sound” because vision is somewhat altered from that of a normal eye. However, the horse may still be functional and serviceable with the appropriate training. The subpalpebral lavage system is used to deliver medication to the horseâ€™s eye easily and efficiently. The system is made from a flexible tube which is passed through the upper eyelid into the conjunctival fornix (the uppermost space located between the pink tissue of the eyelid and the eye). Medication is introduced to the system at a distant site by injection and is delivered to the eye through the tubing. Upon reaching the end of the tubing in the upper conjunctival fornix, medication exits the system and runs over the eye. Medications should be injected slowly into the system and significant amounts of resistance should not be encountered. Introduction of medication into the tubing should be followed by injecting enough air into the system to move the medication through the tubing to the eye. With each successful delivery of medication to the eye, the medication should actually be seen running out over the eye. Vaseline can be smeared on the skin under the eye to prevent a moist rash.